The call for papers for this conference alludes explicitly or tacitly to two different divides. The first one is that between Comparative Politics on the one hand, and International Relations/International Political Economy on the other, in the field of Middle East studies. The second, more implicit divide, suggests that the study of international relations of the Middle East has been detached from the study of International Relations more generally. This memo responds to the organizers’ invitation to reflect on some of my own efforts to transcend those two divides. Indeed, the conceptual framework I revisit here has also sought to extricate the study of international relations/international political economy of the Middle East from yet a third divide, one that implicitly or explicitly separates the Middle East from other regions, as if things were so completely different (“exceptional”) in the former that they almost preclude cross-regional inferences. This is certainly not the case. All these divides may have more to do with sociological aspects of the profession than with intrinsic analytical barriers. The theoretical framework I discuss in this memo builds on political coalitions as a micro-foundation for understanding and integrating the causal pathways running through global, regional, and domestic levels of analysis. Figure 1 below describes the linkages among them. I dwell on the domestic distributional consequences of globalization as the analytical point of departure (Vector 2). These second-image-reversed (Gourevitch, 1986) or outside-in effects lead to the constitution of two ideal-typical domestic coalitions—internationalizing and inward-looking—vying for power and control of their states. Domestic politics and institutions, in turn, convert those effects into competing grand strategies of local, regional, and global reach—inside-out effects that are synergistic across all three levels. The inside-out effects from the domestic to the regional realm (Vector 3) are thus a primary concern for understanding the nature of regional orders. The latter emerge from the strategic interaction among different domestic coalitions in a given region (Vector 4). Regions reflecting dominant internationalizing coalitions typically display more cooperation than regions largely controlled by strong inward-looking ruling coalitions. In turn, regional arrangements in internationalizing regions reinforce the domestic logic of internationalizing coalitions. Similarly, regional arrangements in inward-looking regions reinforce the domestic logic of their inward-looking coalitional referents. 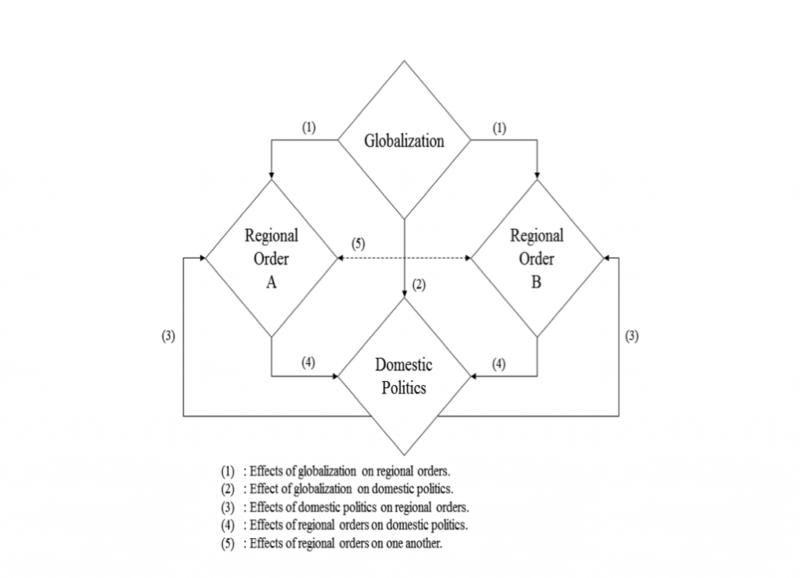 A region’s coalitional center of gravity–which coalitions are dominant–also affects the way regions interact with one another and the extent to which models of regional order diffuse across regions (Vector 5). Subsequent sections in this paper dissect these vectors in greater detail and apply the general framework to the Middle East. However, because the framework is suitable for understanding regional orders in a globalized world more broadly, comparisons with other regions are especially illuminating. I include them because such comparisons, along with the conceptual framework itself, also help extricate the Middle East from the three disciplinary divides discussed in the introduction. Increased openness to international markets, capital, investments, and technology affects individuals and groups through: a) changes in employment, incomes, prices, public services, and b) their evolving commitments to international regimes and institutions in economics, security, the environment and other domains (Keohane and Milner, 1996; Mansfield and Milner, 1997). Politicians understand the mobilizing capacity of economic interests, norms, and identity associated with dilemmas of internationalization. They thus organize constituencies across the state-society divide into competing coalitions, and craft models of political survival attuned to those coalitional preferences. Politicians across regime types (democratic, autocratic) rely on available rules and institutions to fashion coalitions that maximize their own relative power and control over resources, leading constituencies to logroll across material economic and ideational interests of both state and private actors. Two ideal-typical coalitional forms emerge from that process and vie for power and control of their states: internationalizing and inward-looking. Ideal-types are heuristic devices that transcend historical or “true” realities; hence they are not applicable to all cases equally or indeed to any particular case wholesale (Eckstein, 1975; Ruggie, 1998:31–32; Weber, 1949: 93). Yet they can be helpful in placing real-world domestic coalitions along the internationalizing/inward-looking spectrum. Internationalizing coalitions attract beneficiaries (or potential beneficiaries) of economic openness such as export-intensive sectors and firms, highly-skilled labor employed in competitive industries or firms, analysts oriented towards an open global economic and knowledge (technology) system, competitive agricultural sectors, consumers of imported products, and bureaucracies central to economic reform (independent central banks, finance ministries, managers of export-processing zones). Inward-looking coalitions attract import-competing firms and banks closely tied to the state, state-owned enterprises and banks, urban unskilled blue-collar and white-collar sectors, state bureaucracies rendered obsolete by reform, considerable segments of the military and its industrial complex, and civic-nationalist, ethnic, and religious movements threatened by internationalization. High uncertainty about the impact of internationalization leaves many behind the “veil of ignorance,” unable to figure out where and how they will come out at the end of the process. When crafting coalitions, politicians portray the benefits and pitfalls of internationalization on the basis of actual or putative impacts. At some times, the two competing coalitions carve out different parts of a state divided by this coalitional competition. At other times, either coalition succeeds in controlling the state and is thus able to implement its preferred model (grand strategy) of political survival in power. Internationalizing models rely on economic performance and growth via integration into the global economy whereas inward-looking models rely on autonomous “self-sufficiency.” The two ideal-types also differ in the extent to which states (including military-industrial complexes) replace or enhance markets. Where internationalizing coalitions successfully realize their favored model of political survival, they capture opportunities offered by the global political economy and institutions. Their grand strategy emphasizes regional cooperation and stability and access to global markets, capital, investments, and technology. They accord primacy to macroeconomic stability and international competitiveness, because both are expected to reduce uncertainty, encourage savings, and enhance the rate of investment (including foreign). Why are these coalitions more prone to cooperate with their neighbors? Because conflict-prone postures require the mobilization of resources for potential military conflict which, in turn, contributes to many of the ailments afflicting domestic political economy from the standpoint of internationalizers. Such ailments include unproductive and inflation-inducing military investments and the protection of state enterprises under a mantle of “national security.” Mobilization of resources for conflict often emasculate macroeconomic objectives via expansive military budgets, government and payments deficits, the rising cost of capital, inhibited savings and productive investment, depleted foreign exchange coffers, overvalued exchange rates, currency instability and unpredictability, and foiled foreign investment. For example, many East Asian ruling coalitions have steered their states in an internationalizing direction since the 1960s. Where inward-looking coalitions realize their favored model, they challenge the reach of markets, international institutions, and powerful states, asserting complete sovereignty and control across issue-areas. Their grand strategy, in its purest form, hinges wholly on the interests of state industry and ancillary inward-looking military-industrial sectors, as well as of ethnic, religious, and nationalist groups threatened by internationalization. Regional insecurity and competition helps sustain these coalitions in power whereas rising regional cooperation has the potential for eroding their resources and undermining their objectives. Inward-looking state and private actors are generally unconcerned with the prospects that regional instability might undercut foreign investment. Typically these coalitions rely on populism, active states controlling prices, increasing nominal wages, overvaluing the currency to raise wages and profits in non-traded goods sectors, and dispensing rents to private firms by discriminating against competing imports through tariffs, controls, and multiple exchange rates. Inward-looking coalitions flout an array of international economic, political, and security regimes that they depict as anathema to the economic, national, ethnic, or religious objectives they safeguard. Many Middle Eastern ruling coalitions have steered their states in an inward-looking direction since the 1950s. Grand strategies, or models of political survival in power, are also ideal-typical categories rarely matching the real world perfectly. Yet they provide a benchmark for classifying grand strategies along a single spectrum. Such strategies don’t envelop states overnight or in linear fashion. They evolve through coalitional competition and causal mechanisms that link comparative and international politics (Solingen, 2009). They thus constitute a productive approach for taking account of Vector 3 effects that map domestic politics onto the regional level (inside-out). As we shall see next, however, the domestic coalitional competition in one state is itself affected by the nature and strength of domestic coalitions in other states in the region, forcing attention to Vector 4 (outside-in) effects. The relative strength of coalitions—at home and throughout the region—accounts for the degree to which grand strategies are more pristine or diluted versions of the ideal-type. A state’s regional environment can be defined as an aggregate measure of the relative strength of internationalizing or inward-looking coalitions. An internationalizing regional environment is one dominated by a more or less homogeneous cluster of internationalizing coalitions, as in East Asia in recent decades. The reverse is true for an inward-looking regional environment dominated by a more or less homogeneous cluster of inward-looking coalitions, as in the Middle East in recent decades. What are the effects of strategic interaction among different coalitional combinations in a given region? The incidence of each coalitional type, and the different regional coalitional clusters they constitute in the aggregate, define a region’s propensity for conflict and cooperation. Regions reflecting dominant internationalizing coalitions typically display more cooperation than regions largely controlled by strong inward-looking ruling coalitions. In turn, regional arrangements in internationalizing regions reinforce the domestic logic of internationalizing coalitions. Conversely, regional arrangements in inward-looking regions reinforce the domestic logic of their inward-looking coalitional referents. These are Vector 4 effects in action. Different coalitional mixes throughout a region thus create and reproduce typical regional orders and, conversely, are affected by them. Strong internationalizing coalitions in a region are expected to create more cooperative and peaceful regional orders (“zones of peace”) than those typical of clusters dominated by strong inward-looking coalitions (“zones of war”). Regions dominated by mixed or hybrid coalitional forms exhibit “zones of contained conflict” that elude extensive cooperation or war. Converging internationalizing grand strategies in a given region are collectively stable, creating an environment least propitious for inward-looking strategies. The more internationalizing the region’s center of gravity, the higher its reliance on cooperative (though not necessarily formal) arrangements that enable implementation of all pillars of internationalizing grand strategies. Converging inward-looking strategies are also collectively stable, feeding on each other’s existence, resulting in war zones resistant to internationalizing strategies. Internationalizing “zones of peace” challenge lingering inward-looking coalitions in their region undermining their grand strategy, from the merits of economic closure to the advantages of militarization. In time, these regional orders can overturn coalitional balances within outstanding inward-looking states, easing their eventual inclusion into their regional framework, as in ASEAN. Where inward-looking coalitions dominate a region, “zones of war” trigger pressures that loom large on the survival of internationalizers, weakening them and forcing them to dilute their preferred strategy. Regions dominated by inward-looking coalitions, such as much of the Middle East since the 1950s, have threatened the viability of would-be internationalizers in Jordan, Lebanon, Kurdish areas, and elsewhere for many decades. Empirical applications provided detailed evidence for patterns consistent with this framework. Some documented why evolving models of political survival offered compelling explanations for decades of Middle East wars and enduring rivalries in the inter-Arab, Arab-Israeli, and Arab-Iranian arenas; for cooperative Arab-Israeli breakthroughs in the early 1990s and reactive responses to them; for why regional economic barriers among Arab states never receded; for why regional institutions such as the Arab Common Market existed largely in paper, much as some of their Latin American counterparts; and for why chemical weapons and missiles have been used most frequently in the Middle East than in any other regions. Inward-looking models account for greater proneness to spearhead more wars than internationalizing ones, intendedly or unintendedly. Competing models also shed light on the taming of conflicts among East Asian states via internationalizing strategies. The absence of war in this region for several decades (over four in Southeast Asia and over six in Northeast Asia) is especially important because serious disputes remain in both cases. This is not a zone of complete harmony. The evolution of cooperation in East Asia and continuous wars in the Middle East raise a puzzle. Why did these divergent paths emerge out of shared initial conditions in both regions? The two regions shared relatively similar conditions in the 1950s and early 1960s, including harsh autocratic rule, ethnic diversity, state-building challenges, and involvement in militarized conflicts. Yet the two looked dramatically different in the early twenty-first century as East Asia became the engine of the global economy. Leading theories of international relations do not provide satisfactory answers to this puzzle. For neorealism the very premise of a Pax Asiatica is erroneous; the universal logic of power distribution reigns perennially, leading to cyclical war or pauses in war-making at best. But what explains the pause? A standard hypothesis—robust, bipolar, and symmetric distribution of nuclear weapons—does not apply here. Other neorealist variables—dramatic changes in power distribution with China’s rise, Japan’s normalization, North Korea’s nuclearization–should have led to war, as indeed has been predicted for decades, but it has not. Fluctuations between U.S. hegemonic assertion and defection have not altered the no-war outcome either. One crucial difficulty with power-based explanations is stipulating whether East Asia has been multipolar, bipolar, or under U.S. hegemony, but there are many others. Neoliberal-institutionalist approaches trace absence of war to institutions presumed to reduce transaction costs and enhance cooperation. However the decades-long Pax Asiatica (no war) has unfolded in the absence of legalized institutions. Regional institutions emerged after remarkable expansion in markets, investment, and cooperation but remained minimalist, informal, and consensus-based. Cooperation preceded institutions to a large extent. Cultural interpretations like “Asian values” and “ASEAN way” have been properly debunked (Kahler 1995); the same cultural construct could not explain both earlier periods of militarized conflict and a subsequent Pax Asiatica. Nor did the ancient “Oriental wisdom’s” penchant for consensus, harmony, unity, and community produce peace in earlier times. Indeed East Asia is not at all culturally homogeneous—it is perhaps less so than the Middle East—yet extremely diverse cultures have not precluded cooperation. Traumatic memories of Japan’s World War II cruelty or of repeated aggressions against Vietnam by several powers have not precluded extensive economic, political, and diplomatic rapprochements, including informal institutions. Democratic-peace theory is inapplicable because Pax Asiatica preceded the emergence of a cluster of democratic states and continues to operate in a region hosting several autocracies. And a fairly autocratic but internationalizing cluster spearheaded more peaceful conditions in Southeast Asia several decades ago. Competing models of political survival can explain the puzzle. East Asian leaders pivoted their political control on economic performance and integration in the global economy whereas Middle East leaders relied on inward-looking self-sufficiency, state and military entrepreneurship, and a related brand of nationalism. But why were such choices made? What remote sources and causal mechanisms explain why the two competing models took root in each region? The permissive and catalytic conditions explaining the emergence of respective models can be briefly summarized as follows: early and effective land reform, a relatively brief period of import-substitution, and natural resource scarcity weakened domestic political opposition to export-led growth in East Asia. By contrast, late, inefficient or nonexistent land reform; longer exposure to import-substitution through extensive state and military entrepreneurship; and abundant oil resources or second-order rentierism (in neighboring non-oil economies) empowered opponents of export-led growth throughout much of the Middle East. Put differently, politically stronger beneficiaries of relative closure, import-substitution, state entrepreneurship, and natural resource monopolies—mostly within the state itself—constituted powerful veto points against alternative models for decades. The respective coalitional formations had first-order implications for three crucial domestic institutions: states, militaries, and authoritarian institutions. First, both models relied on state institutions; however, differences in the character of that reliance would have divergent effects on the respective evolution of states. The two models differed in the extent to which states replaced or enhanced private capital. East Asian states were active lenders and regulators but significantly less active entrepreneurs than their Middle East counterparts. East Asian leaders watchfully steered states to macroeconomic stability and proper conditions for sustained export-led growth. States thus evolved into relatively adaptable institutions linking across the domestic, regional, and global economies. Middle East models shared rigid, exhausted, and depleted state institutions presiding over current account and budget deficits; high inflation and unemployment; and scarce foreign exchange. These states became too weak to exert control over society except through force, as remains widely the case today. Despite significant differences among them (and outliers like North Korea), East Asian states approximated ideal-typical developmental states, Weberian-style meritocratic bureaucracies able to extract resources from society and convert them into public goods (Evans 1995). Despite extensive variation across the Middle East, predatory states undercutting development even in the narrow sense of capital accumulation remained largely dominant, relying on patronage-based bureaucracies primarily supplying private goods to rapacious ruling coalitions. Second, military institutions played important roles initially in both models, particularly as repressive mechanisms of political control. Yet the military itself evolved along different lines, in tandem with prevailing political-economy models. The requirements of each model imposed different constraints on: (1) the relative size and missions of military-industrial complexes; and (2) the extent to which these complexes replaced private enterprise over and beyond arms production. In the Middle East, dismal economies notwithstanding, arms races typical of inward-looking models consistently attracted the highest levels of military expenditures relative to GNP worldwide, about twice East Asian averages. Internationalizing East Asian models were much less compatible with the kind of militarized economies (expressed as percentages of military ownership of the economy) typical of Middle East states. This Middle East pattern replaced and often decimated the private sector whereas East Asian growth models nurtured them. The former entrenched mukhabarat repressive states; the latter professionalized militaries with far more limited political control over the economy and polity. Third, both models relied on authoritarian institutions; yet each would foreshadow differential paths regarding democratization, stemming from variations in the nature and role of military institutions and private entrepreneurship just described. Export-led models incepted by authoritarian leaders and ruling coalitions in East Asia were not precisely designed to advance democracy. However those models unintentionally encouraged democratic institutions via several causal mechanisms: fostering economic growth, stronger private sectors and civil societies, and more professionalized militaries attuned to outward-oriented growth. Over time several—though not all—authoritarian regimes in East Asia evolved into full-fledged democracies. By contrast, Middle East models engendered higher barriers to the development of democratic institutions: weaker private sectors and weakened civil societies less able to demand political reform and entrenched military industrial complexes better able to resist those demands. These differences had implications for regional conflict and cooperation. Their inability to deliver resources and services to constituencies previously mobilized through revolutionary or nationalist fervor, and their efforts to divert attention from failed, economically depleted, entropic, crisis-prone, militarized and de-legitimized models led Middle East regimes to: (a) emphasize nationalism and military prowess; (b) externalize conflict; (c) exacerbate arms races; and (d) engage in competitive outbidding at the regional level. Each of these vectors individually enhanced the prospects for intended or unintended war, militarized incidents, and militarized or political intrusions in the domestic affairs of neighboring states. Collectively they made those even more likely, creating a structural tendency toward conflict even though war itself might not always have been the preferred outcome. Mobilizations, overt subversions, and cross-border invasions were certainly intended but not always controllable. Lacking institutional power and legitimacy domestically and regionally, Middle East leaders deployed violence at home and abroad, evoking Tilly’s arguments regarding the use of force. According to Khouri (2015), “politicized Arab militaries used at home and abroad tend to promote chaos and destroy Arab countries, rather than maintain order and national integrity.” Domestic fragility hidden behind pan-Arab or pan Islamic rhetoric fueled mutual assaults on sovereignty among Arab-states (Halliday 2005). By contrast, East Asia’s developmental states required: (a) contained military-industrial complexes and limited military competition; (b) war avoidance; (c) domestic stability, predictability, and attractiveness to foreign investors; and (d) tamed arms races, lest such races adversely affect conditions (a) through (c). Each of those requirements individually dampened the prospects for war and militarized conflict. Collectively, they made them even less likely despite lingering hostility and nationalist resentment. Inter-state militarized conflict declined in East Asia since 1980s and intra-regional trade and investment expanded dramatically. The previous section analyzed primarily domestic barriers to the development of democratic institutions in the Middle East, particularly its typical political economy model. Other processes affecting democratization are external, stemming from regional or global influences. Studies on international and transnational diffusion, for instance, found regional neighborhood effects to have dominated democratic transitions in Latin America, Eastern Europe, and the Middle East far more so than global ones. One mechanism explaining why democratic transitions tend to cluster within regions focuses on the role of pivotal states. In the post-communist world, such states shared an unusual combination of relatively large and organized opposition movements; enduring authoritarians which could not defeat popular mobilizations; geopolitical importance; similar political economies across neighboring states; and powerful international support for incumbents and opposition, revealing tolerance for regime change (Patel and Bunce 2012). Those conditions in pivotal states signaled to neighbors the potential for further diffusion of democracy. Another mechanism for diffusion of color revolutions was emulation of elite-defection and elite-learning models (Mekouar 2014). The 2011 Middle East contagion brings to relief the complexity entailed in the study of diffusion, with wide-ranging debates over who the main agents were, what causal mechanisms dominated (bread prices, learning, emulation, and identity, inter alia), the varying mix of firewalls and conductivity in the relevant medium, and spatial and temporal patterns (direction of contagion, duration of gestation). While the role of social media is often cited as a core transmission belt, the most affected states were less endowed in such media than those that were less affected by regional diffusion. Indeed recent work found new media not to have played a significant role in either coalescing collective action within countries or underpinning diffusion regionally. However, that type of media would have been more likely to spread information beyond the region than within it. Arab uprisings hailed from Tunisia to Egypt, Yemen, Libya, and Syria. Higher firewalls in Iran, Algeria, and the GCC among others blocked further diffusion. Even assuming primarily regional—rather than global—sources of diffusion for those upheavals, their effects leapt into both adjacent non-Arab states (including Israel’s 2011 protest movement) and into more remote regions, from sub-Saharan Africa to Myanmar, Malaysia, Chile, Wall Street, Frankfurt, and Russia, although with varying intensity. The occurrence and diffusionary potential of the 2011 Arab uprisings may also have deep roots in the models of political survival adopted by different regimes in power over the preceding decades. I outlined earlier why a significant number of East Asian political-economy models (Taiwan, South Korea, Philippines, Indonesia, Thailand, Malaysia and others) were able to re-invent themselves in democratic form, often through the model’s unintended effects rather than by design. I also outlined the domestic sources explaining how internationalizing political-economy models came to take root in that part of the world to begin with. But a more complete account of this process requires a better understanding of regional diffusionary mechanisms. Progressive diffusion of successful export-oriented models arguably predisposed successive East Asian regimes to adapt analogous models to local circumstances in Taiwan, South Korea, Hong Kong, Singapore, Malaysia, Thailand, China, Indonesia, and Vietnam. This diffusion was famously captured initially by the “flying geese” metaphor, pointing to Japanese capital and technology as an agent of diffusion through foreign direct investment (FDI) and bank loans. The economic success of models adopted by Asian “tigers” and “dragons,” in turn, led to a pattern of outward but uneven region-to-region diffusion. Ruling coalitions from Turkey to Chile adapted components of East Asian models. Today’s Pacific Alliance in Latin America (Chile, Peru, Colombia, and Mexico) may well be another instance of such diffusion. By contrast, domestic firewalls—notably dominant coalitions in rigid, exhausted, and predatory states—explain the very limited diffusion of East Asian models into the Middle East. Deeply rooted in the inward-looking political economy described above, these regimes were slower to recognize the end of the brief, “easy,” period of economic expansion under import-substitution. They continued to spend heavily, particularly in the military and its sprawling entrepreneurial activities, leading to inflation, balance-of-payments crises, and further decline (Egypt wrote the manual; Iraq, Syria, Iran, and Pakistan the 7.0, 8.0 and 9.0 versions). Often protected by oil revenues or second-order transfers from oil-rich to oil-poor and other remittances, they responded to economic crises by “deepening” inward-looking models rather than replacing them. “Dutch disease” reinforced reluctance to change. Yet, counter to deterministic oil-curse (or religion-based) expectations, Malaysia and Indonesia were receptive to the regional diffusion of internationalizing models throughout East Asia. Entrenched inward-looking models in the Middle East explain not only the resolute firewalls against extra-regional East Asian models. They also explain intra-regional firewalls in dominant Middle East states that worked to prevent internationalizing steps primarily through mechanisms of coercion and emulation as well as socialization. Nasserite and Ba’athist models—crucial agents of diffusion of inward-looking models—exerted forceful intervention in neighboring states. They threatened and subverted internationalizing efforts by small, resource-poor Jordan, Lebanon, Morocco, and Tunisia. The latter, as well as Turkey and the Gulf, were able to partially stem those intrusions to different degrees. Today it is quite clear what model is diffusing endemically over the carcasses of failed inward-looking states, including Syria and Iraq: extreme variants (Daesh et al.) of autarky-seeking movements. The theoretical framework and applications reviewed here suggest that cleavages between Comparative Politics and International Relations in Middle East studies, between the study of international relations of the Middle East and the study of International Relations more generally, and between the study of the Middle East and that of other regions are not only artificial. They also unambiguously detract from our ability to understand this as well as other regions. The coalitional framework proposed here can also explain additional dependent variables not explored here, such as different patterns of demand for nuclear weapons across regions; different receptivity to external positive and negative inducements to dissuade states from acquiring such weapons; and different proclivities to civil war and state disintegration. The framework defies essentialist approaches to any region. Notwithstanding efforts to distill typical models, regional variation within regions is extensive. Intra-region variation challenges presumed primordial penchants for war or peace in any region. Most states in the analyzed regions may conform to a general pattern, but there were also anomalies. The latter, in departing from modal regional patterns, provide further support for the relationship between different models of political survival and external conflict. Where different models were sought, regional behavior reflected those shifts. Some Middle East outliers strove, at various points in time, to adopt alternative models to those prevailing in their region. Outliers, here and elsewhere, thus question the scope of micro-phenomenological theories emphasizing local cultural origins and regional uniqueness. Above all, the incidence of outliers counters deterministic views about inevitable outcomes in any region. Southeast Asia, once the “Balkans of the East” under inward-looking stewardship, superseded those older models and established cooperative foundations that have largely withstood the test of time. Cases around the world suggest that history can weigh heavily but does not invariably impose a point of no return. Turkey, Morocco, Jordan, Tunisia and some Gulf sheikhdoms have made important strides toward greater economic openness. The barriers are high but not insurmountable. Effective reforms should not be conflated with the much-maligned term, “neoliberalism,” if the latter retains basic features of the old model, including corruption and rent-seeking patterns. Openness to the global economy has lifted many millions out of poverty elsewhere and, done well, can narrow inequality. Only extensive reforms can prevent predatory states from being overrun by even greater predators such as Daesh. Etel Solingen is the Thomas T. and Elizabeth C. Tierney Chair in Peace Studies at the University of California, Irvine and the author of Regional Orders at Century’s Dawn (Princeton University Press 1998), Nuclear Logics: Contrasting Paths in East Asia and the Middle East (Princeton University Press 2007) and Comparative Regionalism (Routledge 2015). Arab Human Development Report. 2009. Challenges to Human Security in the Arab Countries. New York: United Nations Development Programme. Barnett, Michael, and Etel Solingen. 2007. “Designed to Fail or Failure of Design? The Sources and Institutional Effects of the Arab League.’’ In Crafting Cooperation: Regional Institutions in Comparative Perspective, ed. Alastair Iain Johnston, and Amitav Acharya. New York: Cambridge University Press. Bush, Sarah. 2015. “Forms of International Pressure and the Middle East.” Memo for workshop on “IR Theory and a new Middle East” (University of Aarhus and POMEPS, May 8, 2015). Dodge, Toby. 2002. “Bringing the bourgeoisie back in: the birth of liberal corporatism in the Middle East. In Toby Dodge and Richard Higgott, Globalization and the Middle East, ed. Toby London: Royal Institute of International Affairs, 169-87. Eckstein, Harry. 1975. Case studies and theory in political science. In Strategies of Inquiry, vol. 7, ed. Fred Greenstein and Nelson Polsby. Reading, Mass. : Addison-Wesley; 79-138. Halliday, Fred. 2005. The Middle East in International Relations: Power, Politics and Ideology. New York: Cambridge University Press. Kahler, Miles. 1995. International Institutions and the Political Economy of Integration. Washington, D.C: The Brookings Institution. Keohane, Robert O. 1984. After Hegemony—Cooperation and Discord in the World Political Economy. Princeton, NJ: Princeton University Press. Korany, Baghat. 1994. “National Security in the Arab World: The Persistence of Dualism.” In The Arab World Today, ed. Dan Tschirgi. Boulder, CO: Lynne Rienner, 161-78. Legrenzi, Matteo. 2015. “New dimensions of Security and Regionalism in the Middle East.” Memo for workshop on “IR Theory and a new Middle East” (University of Aarhus and POMEPS, May 8, 2015). Mekouar, Merouan. 2014. “No Political Agents, No Diffusion: Evidence from North Africa.” International Studies Review, Volume 16, Issue 2 (June):206–216. Patel, David and Valerie J. Bunce. 2012. “Turning Points and the Cross-National Diffusion of Popular Protest.” Comparative Democratization 10: 1, 10-13. Ruggie, John. G. (1998) “What Makes the World Hang Together? Neo-Utilitarianism and the Social Constructivist Challenge.” In Exploration and Contestation in the Study of World Politics, edited by Peter J. Katzenstein, Robert O. Keohane, and S. D. Krasner, pp. 215-246. Cambridge, MA: MIT Press. Solingen, Etel. 1994. “The Political Economy of Nuclear Restraint.” International Security, Vol. 19, No. 2 (Fall). ——–. 1996. “Democracy, Economic Reform, and Regional Cooperation.” Journal of Theoretical Politics, Vol. 8, No.1 (January). ——–. 1998. Regional Orders at Century’s Dawn. Princeton, NJ: Princeton University Press. ——–. 20003. ‘Towards a Democratic Peace in the Middle East’, in A. Saikal and A. Schnabel (eds.) Peace and Democracy in the Middle East, Tokyo: The United Nations University Press. ——–. 2007a. Nuclear Logics: Contrasting Paths in East Asia and the Middle East. Princeton, NJ: Princeton University Press. ——–. 2007b. “Pax Asiatica versus Bella Levantina: The Foundations of War and Peace in East Asia and the Middle East.” American Political Science Review 101, No. 4 (November). ——–. 2008. “The Genesis, Design and Effects of Regional Institutions: Lessons from East Asia and the Middle East,” International Studies Quarterly, 52, 1 (June). ———. 2009. “The Global Context of Comparative Politics.” In Comparative Politics: Rationality, Culture, and Structure, edited by Mark I. Lichbach and Alan S. Zuckerman. Cambridge: Cambridge University Press. ——–. 2014. “Domestic Coalitions, Internationalization, and War: Then and Now.” International Security Vol. 39, No. 1 (2014). ——–. 2015. Comparative Regionalism: Economics and Security. Routledge. Theory and the new Middle East.” Memo for workshop on “IR Theory and a new Middle East” (University of Aarhus and POMEPS, May 8, 2015). Weber, Max. 1949. “‘Objectivity’ in Social Science and Social Policy,” In The Methodology of the Social Sciences, transl. and ed. by Edward A. Shils and Henry A. Finch. Glencoe, III: Free Press. Memo from Marc Lynch and Morten Valbjørn’s letter of invitation. See also Valbjørn (2015). This section builds on Solingen (2015) and Solingen and Malnight (2015). On the applicability of “second-image reversed” approaches to the Middle East, see Bush (2015). Solingen (1994, 1996, 1998, 2007a and b, 2008, 2015); Barnett and Solingen (2007). On countervailing forces that moderate conflict in East Asia despite continued tension, see Solingen (2014). Keohane (1984) differentiates between harmony (i.e., no adjustment, states pursue their own interest) and cooperation, the latter requiring mutual adjustments. For a more detailed argument regarding this section, see Solingen (2007b). Arab Human Development Report (2009). On how welfare support networks by religious parties step in to solve state failure, deepening social divisions and inequality along the way, see Cammett (2014). Dodge (2002). Of 48 militarized regional conflicts between 1965 and 2006, 41 involved Arab-Iranian, inter-Arab, and Turkish-Cypriot dyads. The Iran-Iraq, Iraq-Kuwait/Saudi Arabia, and Morocco-Polisario wars accounted for the bulk of casualties, the only interstate wars with over 10,000 casualties since 1973 until the more recent cataclysmic events in Syria. Seven (of 48) militarized conflicts involved Israel, three of those against Syria and Hezbollah after 1973. Gulf Cooperation Council Secretary General Abdalla Bishara remarked that the basic threat to Gulf states were other Arab states, not Israel (Korany 1994:66). More recently the Council defined Iran as the most serious threat. Iran was involved in five militarized incidents; only the Iran-Iraq war—initiated by Iraq—resulted in 500,000 to 1 million deaths. Turkey was involved in 3 militarized conflicts; only the 1974 Cyprus invasion—which pointedly preceded Özal’s inception of export-led growth—involved thousands of casualties. On the utility of focusing on firewalls that increase or decrease a medium’s conductivity along the diffusion path; on the political agents that seek to reinforce or dismantle firewalls and the causal mechanisms through which they operate, see Solingen (2012). See memo by Legrenzi (2015). On the demand for nuclear weapons , see Solingen (2007a). On Egypt’s current efforts, see Snider (2015).